Every summer, there’s a scourge that plagues both beaches and swimming pools alike: the men’s summer board short. Designed to be worn during intense surf sessions (and other board-oriented sports), the short eventually somehow creeped into everyday swimwear and has risen to default status. This is a problem, as board shorts are generally useless as swimwear and are almost universally unflattering on most men. There’s no mesh inside. This necessitates wearing underwear, which defeats the purpose of wearing a swimsuit in the first place and complicates the matter. A notoriously baggy fit. Most of the traditional surf brands put out board shorts with a terribly baggy fit, accented by way too much length even going past the knees. It’s the beach — it’s OK to show a little skin. The differences between board shorts and regular swim trunks has muddied in recent years, making it even harder to say what exactly you should buy. 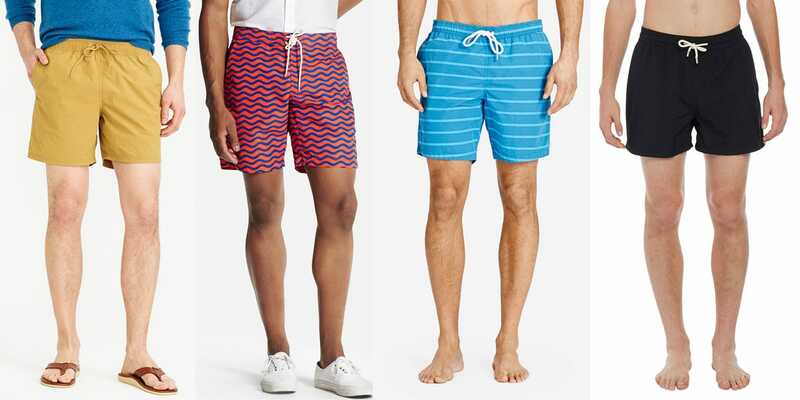 There are now shorter board shorts in fun patterns with mesh lining, and swim trunks without elastic waistbands. To make it easier, we’ll list here three things you need for a great swim trunk: an elastic waistband, a short inseam, and handsome pattern or colour. Uniqlo ($30, left center), and Bonobos ($88, right center). If you want to splurge, Solid & Striped (right) makes a great suit for $130 that many men swear by.